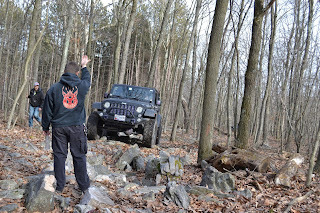 On a chilly day earlier this February, I geared up my Jeep for a day on the trails at Anthracite Off Road Adventure Area. AOAA is about 30 minutes North of Rausch Creek Off Road Park in Pennsylvania. It was an up and at 'em early morning as I met up with other Jeepers, my first big Jeep convoy. I looked forward to this day as it was only my second time at the park. A day for new trails as well as wheeling with some great Jeep friends I met through the internet. It was also the first time wheeling with a fellow YouTuber, and Jeeper, CPO from 03dJeeps. We met a couple of years ago, but were never able to get our calendars to mesh for some wheeling time. Nate, AKA SWBCrawler, was our appointed guide as he knows the park well. He is also a fellow podcaster who contributes content to the Jeep Talk Show podcast, and fills in as host from time to time. He also trail guides for Off Road Consulting and Driving Instruction. He is an awesome spotter! The plan was to wheel as many blue trails as we could hit. In the past the mention of blue trails terrified me. But this day, I was filled with excited anticipation. Trusting in Nate's spotting abilities I put my Jeep in his hands. Well that, and I was in a Rubicon. AND... I have had several good teachers over the years. It was time I trusted in my driving abilities. Another reason my mind was at ease, I knew the type of Jeepers I was hitting the trails with. All with the same mindset of, out on the trails with our daily drivers looking for adventure in some more difficult trails, but not wanting to go home with damaged Jeeps. As we traversed our first blue trail we came upon Trail "W", a black trail. I was met with indecision. Should I try it? I knew my Jeep could do it easily. It was my abilities that I questioned. I stepped out of my Jeep, and walked the trail myself. Yep, I decided. I needed to up my game so Trail W it was. I made it through the trail, over the rocks to the end with no damage. However, not with out a few expletives. All in all it was an amazing day, on amazing trails, with amazing friends. I gained so much confidence in my driving skills, knowing I am great at picking out lines. I do need to work on my confidence on the fact my Jeep will not tip over. Actually I don't think I will ever loose that fear nor the fear of heights. It makes for a fun adrenaline rushing day.